Mercy Mounthawk has always boasted a superb student choir. The choir comes from a broad spectrum of the student body and performs at many school functions and events. 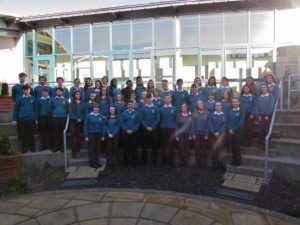 The standard of performance is always highly commendable and is a testimony to the efforts of teachers Ms. Caitríona O’Sullivan and Ms Sinéad Muldoon-Walsh. Many of the rehearsals take place during lunch breaks which facilitates student involvement in this very worthwhile extra-curricular activity. Performances are also accompanied by student musicians on occasion.